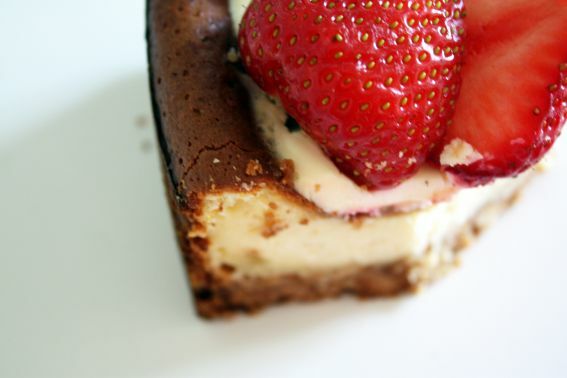 Don’t need to say much about it… just heavenly delicious and unbeliviable easy to make! *yummi* 1. Butter a 26-cm springform. 2. Mix the biscits, sugar, cinnamon and butter together and make a ground in the springform. 3. Mix the creme fraiche, Philadelphia, sugar and vanille sugar with your mixer. Add the eggs one after the other and mix always well in between. Add the milk and the flour and mix as well. 4. Bake for 1 hour in your preheated 170°C oven. Let it cool down with the oven door open. 5. After cooling spread it with 100g cream frache and let it cool in your fridge for at least 3 hours. 6. Decorated with strawberrys or whatever you like.